We have worked with thousands of companies over the last 25 years, both big and small to help bring the best out of their display. From simple banner prints to full modular exhibition stands that incorporate large graphics, exhibition furniture, counters and display stands. Our friendly team of display experts are on hand to guide you to the perfect marketing display for your budget. Below you can see a selection of clients that have worked with us in the past to maximise their marketing potential. Health insurance company Reward Health needed portable display equipment for their upcoming exhibitions. When Rightmove wanted to help their network of estate agents they chose us to provide 50 pavement signs. 32 giant banner stands were despatched by sea to the Seychelles to be used in various art projects. 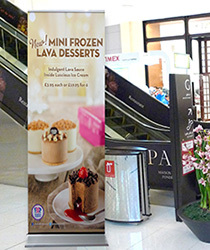 Baskin-Robbins were in need of a large number of banner stands with graphics that could be easily replaced. Pace Networks were at the Excel exhibition centre and were in need of a high quality gantry system. The Cambridge University Eco Racing team were provided with a pop up stand, tablecloth and roller banners. We were approached by the innovative health insurance company Reward Health who were looking for something portable, yet eye-catching, to promote their business at a number of exhibitions throughout the UK. At the shows, Reward Health staff would be on hand to offer massages and demonstrate fitness techniques and showcase health life styles. The solution was a combination of pop up stands, exhibition counters and Vector modular display systems which would give them the flexibility to maximise the area at the different exhibitions they were attending. Reward Health are a health insurance company determined to revolutionise the health of the nation. The brainchild of brothers Rob and Chris Downham, they’re partnering with numerous companies to encourage people to live healthy lives whilst gaining rewards and protection along the way. 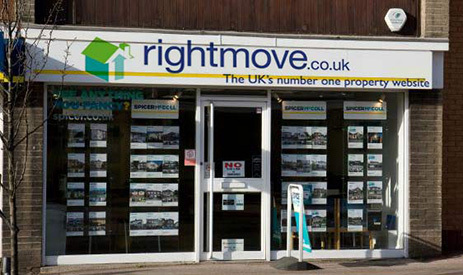 When Rightmove wanted to help their network of estate agents with store promotions they chose Discount Displays to provide 50 Booster pavement signs as part of the display strategy. Rightmove supplied the individual estate agent logos, which our artwork department incorporated into a pair of PVC outdoor posters for each sign at our in-house studio. As well as the bespoke branding, the Rightmove logo was printed on the top panel using permanent printed self adhesive graphics using our HP printer with eco friendly latex inks. After a final quality check despatch to over 50 different destinations took place. Rightmove is the UK's largest property portal. Their aim is to be the place for UK home hunters to find details of all properties available to buy or rent. They floated on the stock market in 2006. We were proud to work with The National Arts Council of Seychelles to produce 32 giant banner stands with bags for their various events throughout the year. Working closely with event sponsors Cable and Wireless Seychelles on the branding, the giant banner stand artwork was produced at our in-house studio in Croydon ready for its tropical destination. The stands were despatched within 5 days of the order being placed and were delivered by sea to the Seychelles in time for their events. The National Arts Council of Seychelles is a corporate body responsible for coordinating the arts at all levels and for all persons in Seychelles. It works with artists associations and individuals in promoting artistic creations and development in all the arts. Working alongside creative agency Southpaw Communications, we produced a large number of banner stands for their client Baskin-Robbins. 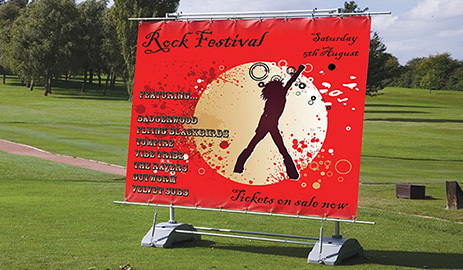 With over 100 stores in the UK, they were in need of a banner stand where the graphics could be easily interchanged to display current offers and relevant pricing. The specification also asked for a small footrpint and a stand that is available in a number of heights. After this work we were chosen to produce displays and graphics for Baskin-Robbins sister company Dunkin' Donuts first UK store launch. 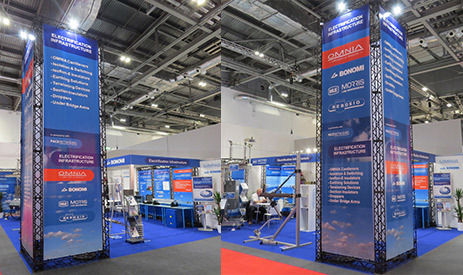 Exhibiting at the Excel exhibition centre, Pace Networks needed a gantry display system that was high quality and durable to reflect their business values. We ran through our truss and gantry options and came up with a corner system and a truss tower. The tower in particular made a real impact at the show and allowed for custom printed branding on each side. Rob from Pace Networks said "We were genuinely impressed how solid the kit is (as was a rigger who came to install), we looked different to others and it fitted our engineering market perfectly." Pace Networks are a specialist sales and marketing organisation, providing UK operators of high and low voltage networks with products to improve safety and reliability and to reduce whole life costs. provides the operators of high and low voltage networks in the UK with products to improve reliability & safety and reduce whole life costs. CUER needed promotional equipment for the launch of the latest iteration of their racing car. We worked with them to provide various options that would best get their message across based on the usage and graphics specification. In the end they opted for a 3x3 pop up stand with printed graphic, customer printed table cloths and two roller banner stands complete with bespoke graphics. Working with their artwork team, our own print team got to work producing high quality prints of their provided designs. The team as CUER were delighted with the finished result and we are looking forward to continuing our partnership for the following year. Cambridge University Eco Racing (CUER) is a 60 strong student organisation that designs, builds and races solar powered vehicles. Founded in 2007, their mission is to inspire as well as innovate. 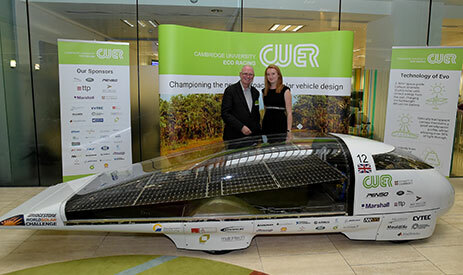 CUER are the UK's number 1 solar racing team and strive to maintain excellence. They are a not-for-profit organisation that focus on technology and education. We are proud of the diversity of work we undertake that reaches every industry and type of organisation. As well as the companies above, we have also worked with the following; Admiral Group PLC, Aldi UK, Allianz Global Assistance, ANZ bank, Arriva London Ltd., Arsenal Football Club, ASDA, AXA Wealth, Balfour Beatty Construction Services UK, Bank Of England, Barclays, Barbican Centre, BASF PLC, BBC, ITV, Channel 4, Belgian Tourist Office, BenQ Uk Ltd., Bernard Matthews, Berkely Homes, British Transport Police, BskyB, BT Sport, BUPA international, Canary Wharf Management, Caterham Cars, Tesla, Chessington World of Adventures, Cineworld, Dennis Publishing Ltd., Department of Energy and Climate Change, DHL, DKNY, Ducati, EDF Energy, Edinburgh Zoo, Electrolux, Environment Agency, Equifax , Fortnum & Mason, Fred Olsen Cruise Lines, Fujitsu, Guardian News Media, General Medical Council, Goodwood Road Racing Club, Harley-Davidson Europe, House of Fraser. Husqvarna, KPMG, Lancashire County Cricket Club, Leicester Tigers, Manchester Airport, Marriott Hotels, Mencap, Michael Kors, Mitsubishi, Morgan Stanley, National Assembly for Wales, NatWest, Network Rail, NHBC, NSPCC, Ocado, Oxfam, Pioneer, Plaid Cymru, Procter & Gamble, Reuters, RNLI, Sainsbury's, Schuh, Selfridges, Specsavers, Standard Bank, Tesco, The National Trust, The Prince's Trust, The Ritz, Top Gear, UCAS, Yodel as well as many local governments, charities and health organisations.